VIDEO: Is this chilling moment ghost of dead minister moves door at haunted South Yorkshire church? This is the terrifying moment the ghost of a dead minister moved a door at a haunted former church, according to a paranormal investigator. South Yorkshire ghost hunter Phil Sinclair says the minister spoke to him and also made its presence felt during an investigation at the church between Barnsley and Rotherham earlier this week. READ MORE:Is this the chilling moment the ghost of a medieval monk was captured on camera on one of Sheffield's most haunted roads? Phil, who has carried out investigations at a number of haunted sites across South Yorkshire said: "In all my time paranormal investigating, this is the best evidence of the paranormal I've captured. "I definitely feel the minister was trying to make contact." Phil and cameraman Ash Cox were exploring the former church, now known as a community centre called the Comeback Centre in Brampton when they say they were contacted from the other side. READ MORE: Is this the moment ghost hurls a glass at a woman inside haunted Sheffield pub? Added Phil: "There have been reports of things being moved around on their own and people have been experiencing strange activity in the chapel." The clip shows Phil acting with surprise as a ghost contacts him through an Ovilus - a device which detects environmental readings and turns them into words. He then turns to see a door at the community centre swing on its hinges. 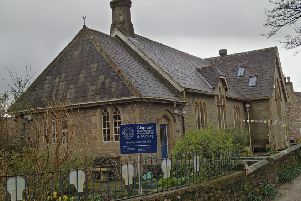 He said: "The chapel used to be a working chapel before being transformed into a community centre in recent years. "I feel I made the greatest capture in all my time I've been paranormal investigating. I feel I made contact with the minister of a haunted chapel who went on to communicate by moving the door." Sheffield based Phil said: "Readers need to see this footage."